Click here to see examples of mechanic’s stethoscopes. We have been known to compare, in casual conversation, the similarities in thought process when a doctor diagnoses a patient and when a mechanic diagnoses a car. Now, we acknowledge that a car is a mechanical system with a finite amount of known variables whereas the human body is a complex chemomechanical system with infinitely more variables and unknowns. That said, both professions are often presented with a set of symptoms that they must interpret to find the root cause. As such, it should come as no surprise that some tools that are relevant to doctors are also relevant to mechanics. One such tool is the stethoscope, which mechanics might also benefit from when trying to diagnose the source of various engine noises. Much like symptoms of a disease, the sounds that engines and transmissions make can be used as clues for diagnosing problems. A knocking noise in an engine might be coming from a connecting rod. Then again, it could be coming from somewhere within the cylinder head. Without a way to pinpoint the location of the sound, it can be very hard to diagnose what is actually making the sound. Stethoscopes transmit sounds from a contact point through a diaphragm, creating vibrations that travel through air-filled, hollow tubes to the listener’s ears. While doctors typically use bell-shaped stethoscopes, mechanics and automotive technicians normally use pointed ends on their stethoscopes. This makes it much easier and safer to reach areas of an engine without having to place your hand in harm’s way. It also pairs down the volume a little bit and protects your ear drums. Stethoscopes can also be used to find the source of air leaks. Normally, the pointed contact end will be removed, and a rubber or plastic hose will be equipped to make listening for air leaks much easier. This makes finding exhaust and vacuum leaks much easier in many cases. We have also used this method when trying to find the location of wind noise inside a car such as through an improperly sealed windshield. The truth is, as simple as they look, there really is a meaningful difference between high quality stethoscopes and cheap versions. Poor quality units are going to produce phantom noises, and transmit inaccurate sounds to your ears. A good quality stethoscope will pick up even the slightest sound, and accurately transmit a clear sound to your ears. 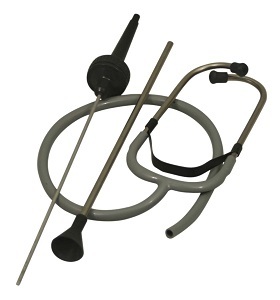 Our pick for the best mechanic’s stethoscope is the Lisle 52750 Stethoscope Kit. It is a dual purpose stethoscope that can pick up both mechanical and air-induced sounds accurately. For starters, the tubing is very high quality and looks like it would be just as happy in an operating room as it would in your garage. Some stethoscopes we have used have had cheap, almost plastic-like tubing that is prone to becoming brittle and cracking with age. While you might save a few bucks with one of those products, we wouldn’t recommend it as you’ll have to replace it sooner. Quality tubing is going to last longer and make using the tool much easier since it will stay soft and compliant, allowing you to get the contact end to where it needs to be. The Lisle stethoscope comes with a solid metal contact end for detecting mechanical sounds commonly associated with internal engine and transmission damage. For air related sounds, Lisle has included a funnel amplifier with this kit. Simply unscrew the contact tip and replace it with the funnel amplifier to easily locate the source of wind and air noises. At the other end of the stethoscope, the ear piece is quite comfortable. Low quality units almost always sit uncomfortably in the ear, making it almost unbearable to use the tool. We were very surprised at how soft and comfortable the ear pieces are on the Lisle product relative to other automotive stethoscopes out there. Another thing that surprised us was how articulate the sounds were when we used this stethoscope. There was almost no background noise when using the contact tip. Other products we tested transmitted surrounding noises through the ear pieces, but the Lisle unit seemed to cut down on this considerably. We recommend this stethoscope above all the rest, and currently keep one in our tool box. The price is great, the quality is great, and we know it will last for many years. As far as best pricing, we suggest checking Amazon first thanks to their extremely competitive pricing. They tend to have the best shipped price around and shipping tends to be pretty quick. 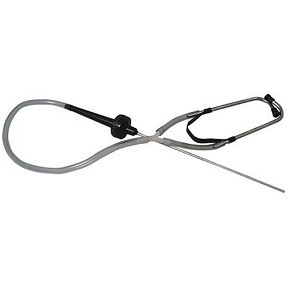 Overall we think you will be highly satisfied with the Lisle stethoscope and give it a solid recommendation. Happy wrenching! To see more pictures, read more reviews, and check out the current price, click here.